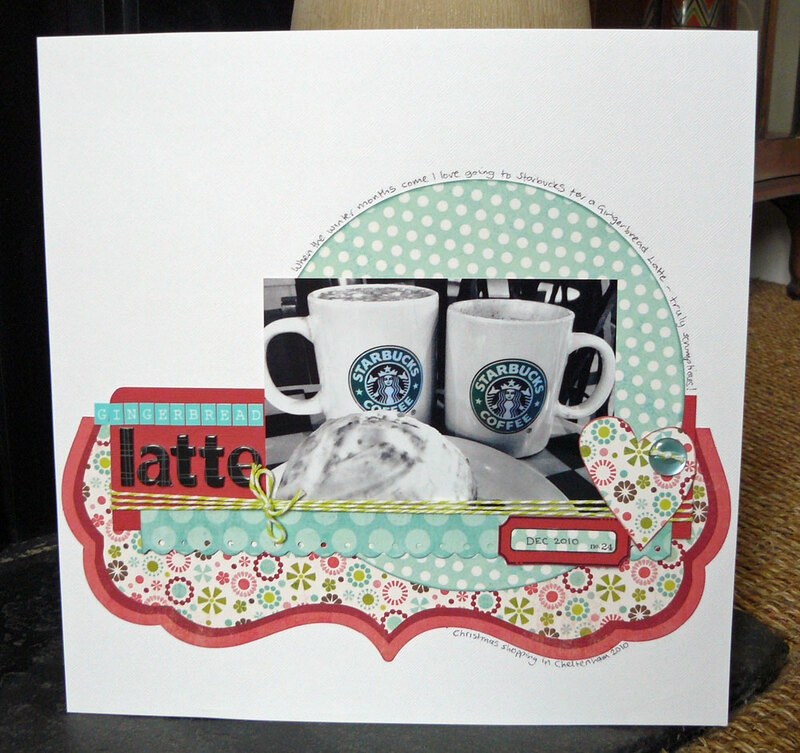 My first LO with my new monthly kit from Gotta Craft, celebrating my love of the Gingerbread Latte! In the winter I crave visits to Starbucks for my fix. Gingerbread Latte's may be the most utterly scrumptious thing known to man. I was not sure at all about this kit as it's very bright AND very pink, neither of which is very me. However, one of the purposes of getting a kit was to try to get outside my comfort zone colour wise. I do gravitate towards blue and brown almost all the time! So this is the result of my first encounter with the kit and I have to say I am pleased with it. I used the reverse side of some of the papers as they were more muted (the polka dots) to balance the busy shaped paper. The kit is Lime Twist from MME in case you were wondering. Oh it's perfect ... Other than the gingerbread lattes that is LOL. In all seriousness, I really think it's amazing. Love the twine tied round! And the writing over the semi circular spottiness. I've never been to a Starbucks so next time I'm in a city in the winter I shall check out the phenomenon that is Gingerbread Latte. Still waiting to get my kit Katy when RM finish play silly games! Your LO is fab, I love the heart cut from the pretty paper with the button. It's lovely! I tend to head for the brown as well, and Sandra has helped to move me on to other colours. She has a wonderful knack for buying papers which match photos I already have! Ooooohhhhhh Katy, I'm counting down the time until I can have a Gingerbread Latte!! I LOVE them!! I also have every colour of bakers twine too!! !